I wanted to make sure you knew about my favorite springtime snack recipe. 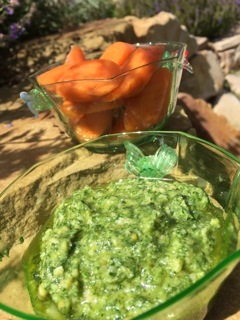 This quick, ultra-simple carrot top pesto lets you finally embrace those fluffy carrot-top greens that peek out from your bag on your way home from the farmer's market. Don't toss them in the trash, or even the compost! This surprising ingredient is not only brimming with good for you nutrients and antioxidants, it's a fresh, crave worthy take on pesto. And eating "root to tip" is one of the best ways to get more value for your for food dollar while eating in a way that helps regenerate both body and planet. A fun tip is to slice those beta-carotene-rich carrots on the diagonal. It makes for a welcome change from ho-hum carrot sticks (not to mention, they also provide the perfect shelf to slather pesto on — think carrot chips). Remember, I recommend using organic carrots for this. Store the carrot tops separately from the carrots once you get home from the market so the tips don’t drain energy and moisture from the roots. Place first 5 ingredients in a blender or food processor and pulse until combined (scrape down sides if needed). Add pine nuts and Parmigiano and pulse until combined. Serve with carrots.